I’ve been spending most of my days as of late, with my cute little guy. As he sits, sleeps, or eats in my arms I do sneek in some time to fumble through cookbooks and magazines. 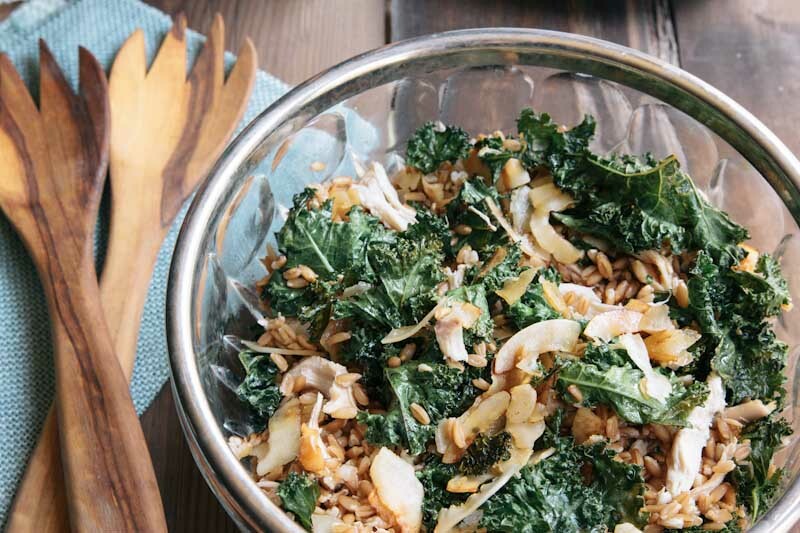 I flipped through Heidi Larsen’s Super Natural Everyday Cookbook and found a little treasure, Kale and Coconut Salad. We’ve now made the recipe a few times, adding chicken for some extra protein, and changing it only a tad! This is a great summer picnic recipe, perfect for lunch or a light dinner. As a new mom, I’m trying my best to be conscious of my sweet time with Everett. Though I definitely do look through cookbooks and social media from time to time, I really hope to be fully present with him instead of always being distracted by social media or work related things. This is super hard for someone whose job revolves around the online world but I am trying. When he’s awake I try and talk to him or play with him, which mainly consists of him wiggling and me giggling. When he’s asleep sometimes I hold him and just enjoy the preciousness of the moment and other times, I lay him beside me while I get some work done. During feeding times (which are about 7-8 times a day) I try to only be on my phone two of them, then the rest, we are just together. I read verses to him or just sit with him, taking in all of his ever changing features, noises, and movements. My friend Carrian and I were talking recently about having balance as a blogger and a mom. Blogging really is a beautiful job for a mom, giving that I am able to make money and stay at home but it can also be a huge distraction. There is always more work you can do and having a smart phone makes it so easy to work all the time. Another blogging friend, Heather, says she tries to get most of her work done at the beginning of the week, other bloggers work only during nap times… many of us struggle with this. If you’re a blogger and say at home mom, how do you keep balance? Or if you’re a parent who works outside of the home, what things do you do to be fully present when you are at home with your kids? Any tips, stories, schedules are appreciated! An easy weeknight meal like this one is helpful when you’re trying give give most of your attention to kids or in my case, a new baby! 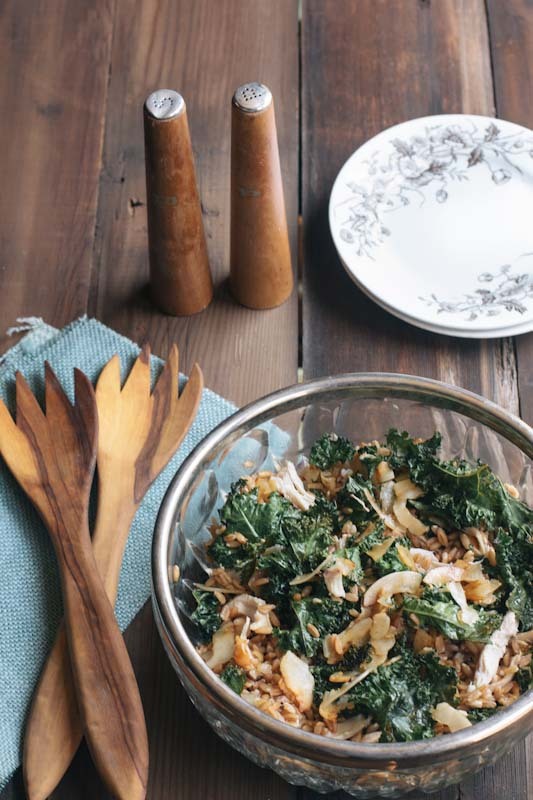 An easy Kale Salad recipe incorporating coconut, chicken, and asian flavors. Recipe adapted from the Supernatural Everyday cookbook. In a large bowl whisk together the olive oil, sesame oil, and soy sauce. Toss kale and coconut with the 3/4 of the sauce. 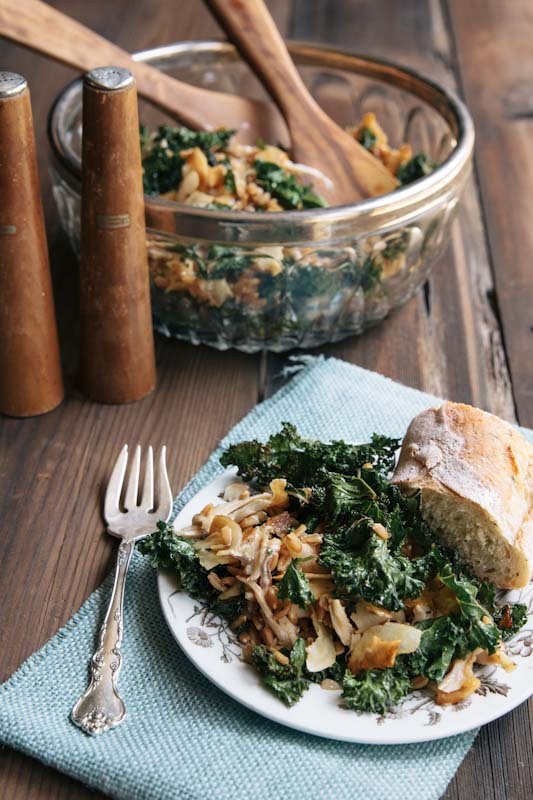 Lay out the kale and coconut on a large rimmed baking sheet and bake for 14 minutes, flipping the kale once during baking. Meanwhile cook farro in a large pot of boiling water (should take about 20-25 minutes for it to get chewy). Remove from heat and drain. 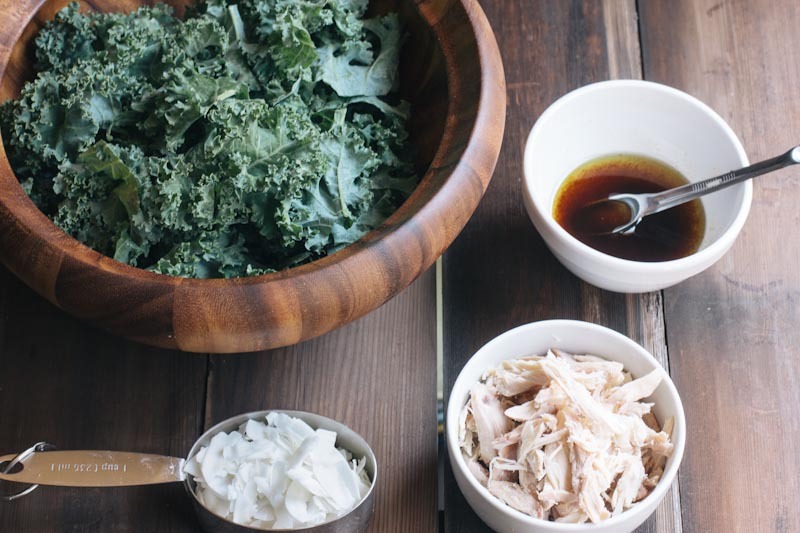 Mix the kale and coconut in with the chicken, and faro, then drizzle additional sauce on top. You can substitute rice or quinoa for the farro or just remove the grain all together for a pure kale and chicken salad. I have all the ingredients for this dish! I just love when that happens. Balance. Ah, balance. One of the biggest things I try to do (and I’m not perfect at it) is unplugging as much as possible on the weekends. Not really a specific tip for moms but just great for everyone. I’m really trying to live in the moment. Balance and how to be fully present? I think that I’ve learned that it’s an impossible dream. 🙂 My twin ladies are almost two, and there is no way that I can be with them all the time, or remember every little thing about them. Loved this salad so much! I’ve been waiting for you to post this so I can make it myself! Balance is so, so hard. I work during naptimes though sometimes that spills over if there is something that just can’t wait, like photographing a recipe. And it usually ends with me giving in to the toddler who is crying at my feet. I do try (but so often fail) to keep off my phone when he is awake, unless I’m photographing him of course. Being fully present and soaking up fleeting, precious moments is such a struggle! But at the same time it is what I want, both in my relationships with my kids and in my life in general. I am always so glad to see people (other mothers, or anyone) also working through that challenge and fighting for mindfulness. Thanks so much for all of your beautiful tips and wisdom Julia! It is comforting to hear others struggle with this. 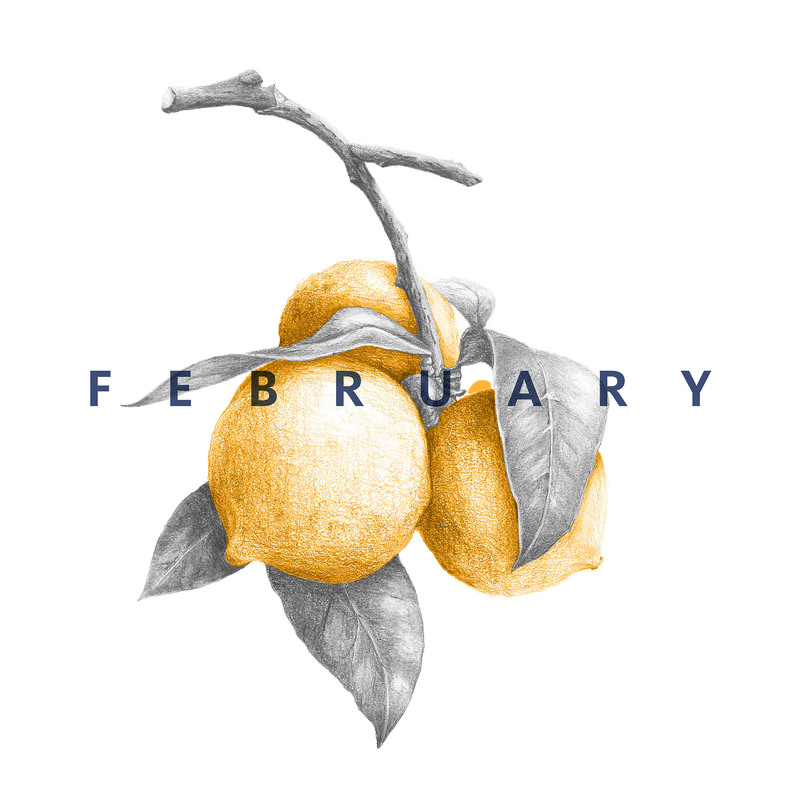 Finding balance…something we’re all trying to do. One thing I’ve done that’s worked wonders for me is I’ve taken Facebook and Twitter off my phone. I try to work them into my work schedule during the morning and afternoon and do so on the computer. Not having them on my phone makes it less tempting to sneak away when I’m with the kiddos. And, this salad looks amazing! Anything with coconut, I’m all over! Wow. This is a great recipe and its made with stuff that I just about always have in my pantry. I recently started putting farro in all my salads, and it gives it such a good taste and texture. 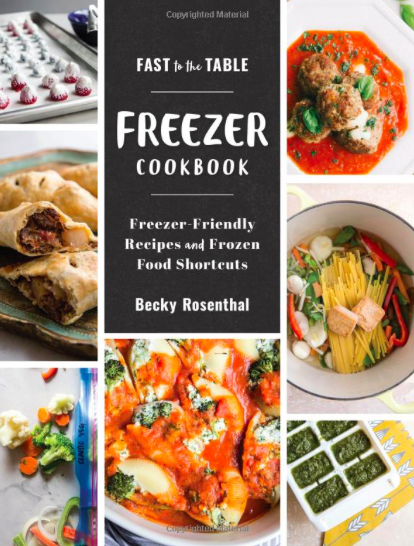 Glad to find another recipe to try!